The gleaming spires of Prague shine brightly on this At Leisure sojourn through the imperial capitals of Prague, Vienna and Budapest. Admire the Gothic, Renaissance and Baroque façades, before joining your Travel Director and travel companions for an unforgettable Welcome Reception to kick off your holiday. Delve into centuries of history, joining your Local Specialist for a guided walk past the city's iconic sights. Visit the final resting place of Bohemian kings, St. Vitus Cathedral, set within the precincts of Prague Castle. Then, admire the Astronomical Clock in Old Town Square, with its hourly Walk of the Apostles. See the 14th-century Charles Bridge, lined with the Baroque statues of saints, before spending the afternoon admiring the spectacular cityscape on your own. Today is yours to explore the legends, castles and palaces of Prague. Follow the Royal Route and discover historic treasures, admire picturesque views of the city from Petrin Hill, or join an Optional Experience to Kutná Hora, with its bone-bedecked chapel and five-nave St. Barbara Church. Spend your evening at leisure, enjoy some of the local beer for which the country is famous. Travel south from Prague through lush Moravian landscapes to Bratislava, passing its Old Town, before continuing your journey to Vienna - our home for the next three nights. Admire the city's musical talents and consider attending a Viennese concert. The heritage of one of Europe's most influential royal families is explored this morning as we 'Dive Into Culture' during a Small Group Sightseeing guided visit to the Habsburg's royal collection of art and wonders before the doors are open to the general public. Visit the spectacular Kunstkammer and admire the valuable objects collected by the emperors and archdukes of Habsburg over the centuries. Later, we join an included sightseeing tour with a Local Specialist to view the Hofburg Palace, the official residence of the President of Austria and former home of the Habsburg Dynasty. We'll see such sights such as the Parliament Building, the magnificent Opera House and St. Stephen's Cathedral with its geometrically tiled roof. Spend the afternoon on your own, indulging in the city's Kaffee culture with a slice or two of Sachertorte. Today is yours to explore the City of Music on your terms. Tread in the footsteps of the great sons of Vienna - Mozart, Haydn and Strauss, as you delve into the city's rich musical heritage nurtured by aristocrats throughout the centuries. Consider a visit to the beautiful Baroque Schönbrunn Palace to see the former imperial summer residence. Journey along the Danube Bend, a narrow twisting valley in the pretty Carpathian Basin, stopping in Esztergom to view its Castle Hill, domed Cathedral, and St. Thomas Hill. We follow the scenic landscape to the romantic city of Budapest where we will spend the next three nights. 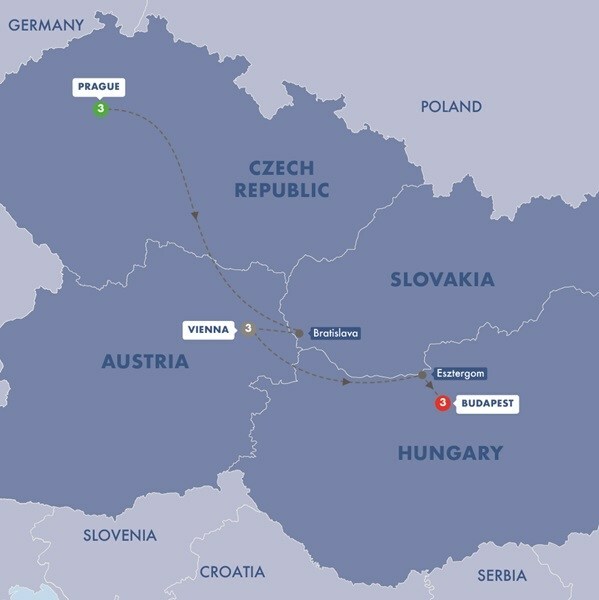 Enjoy a free evening sipping Hungarian wines or consider cruising along the Danube. Join a Local Specialist this morning for a walking tour through the winding lanes of Buda's Castle District in Buda. Visit the Fisherman's Bastion, view the Matthias Church and drive to Pest to see the Great Synagogue, the largest in Europe. We pay tribute to the seven chieftains of the Magyars in Heroes' Square before enjoying time at leisure to indulge in coffee and krémes in the Jewish Quarter or shopping for Hungarian embroidery and fine porcelain. Tonight, we 'Connect With Locals' over a Be My Guest dinner with the Schieszl family and hear the story of their winery. Venture up Gellert Hill for spectacular views of the Budapest skyline, relax in the Szechenyi Baths or consider an Optional Experience to Szentendre, a riverside village popular with artists and craftworkers. On our last evening together, we toast to a magnificent journey to the imperial capitals of Europe and enjoy a Farewell Dinner in a local restaurant. We say a fond farewell to our companions and Travel Director today after an unforgettable At Leisure trip. Transfers are provided to Budapest airport. Conditions apply.